The search giant unveils its vision for UK smart homes. Google's Home speaker is coming to the UK on April 6th, the company said today. Hosting an event in a makeshift London home, the search giant unveiled its hardware plans for Europe, confirming that the smart speaker will cost £129, undercutting the Amazon Echo by £20. That's not all, though: Google WiFi is also coming to the UK on the same day, starting at £129 for a one pack and £229 for two modules. The Home launched at Google I/O almost a year ago, but has been only available to US customers since November. 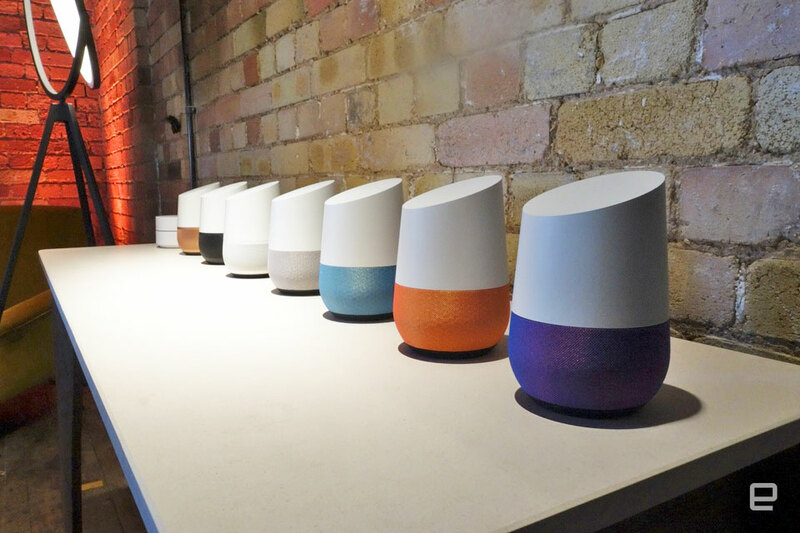 However, in the time between launches, the company has localised the smart speaker, integrating a number of news sources tailored specifically for Britons. The BBC, The Guardian, The Financial Times, The Sun, The Telegraph, Huffington Post, Sky News and Sky Sports are available from launch, with more being added over time. There will be a lack of third-party services, at least to start with. Google says that it is now allowing UK developers to access its Home development kits and that we'll likely see more integrations in the coming months. The launch of the Home in the UK sees Google go up against one of its biggest rivals: Amazon. The Echo and Echo Dot has largely had the smart speaker market to itself until now, but the Home — with its intelligent Assistant — builds on top of Google's existing search and AI expertise. It taps into Knowledge Graph, delivers weather updates and keeps you on top of news, while connecting to streaming services like Spotify and Google Music and radio. Google says the Home and WiFi router will be available via the Google Store, as well as Argos, Dixons, John Lewis and Maplin. The swappable coloured bases will start at £18 for fabric and £36 for metal.